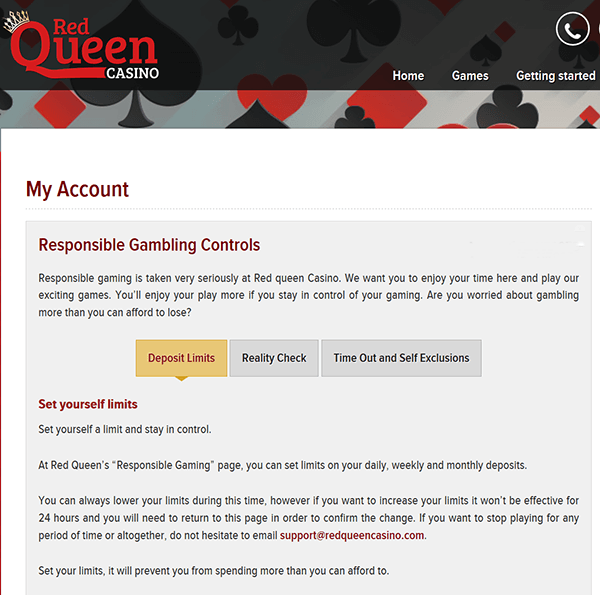 Red Queen Casino is an online casino that is currently being reviewed by myself and the members of our player community at Casinomeister. For a quick overview – they have an awesome selection of games provided by Ainsworth, Big Time Gaming, Net Entertainment, NextGen, ELK Studios, IGT, SG Gaming, Thunderkick, and Williams Interactive to include a load of others. They are primarily focused on the slot player, but they have a few obligatory live games, table games, and some sports – but I’m guessing that’s mostly for show. Signing up is relatively easy – it took me just a couple of minutes – they require a mobile device but their account verification is done via email. There are several methods of depositing to include Neteller, Skrill, Visa and Mastercard. Please note – that if you deposit with Mastercard, you cannot withdraw your winnings to that card. Instead, you can have them bank wired to your own bank. We haven’t tested their payout times yet, but I am hoping via their Baptism by Fire that we will be able to ascertain that information from our members. I did check their online chat – and it is very good. Succinct, polite and friendly. Max cash out is 3000 pounds sterling a day – or equivalent. 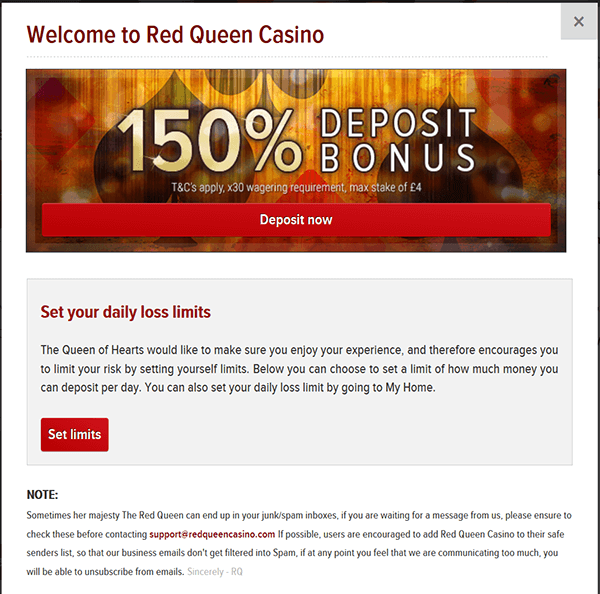 Red Queen casino has been operational for a few years – since around 2013. Owned by Easi Games Ltd. Licensed and regulated in the UK by the UK Gambling Commission. I’ve met the operator a number of times and he’s a stand up guy. 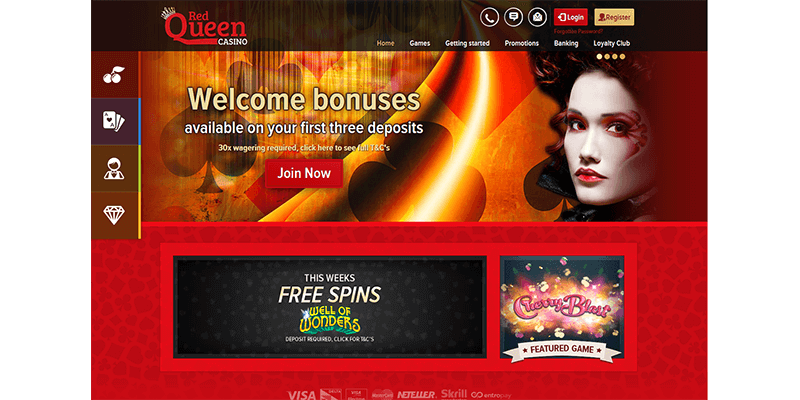 Red Queen Casino is a UK licensed online casino that has been in operation since 2014. Since they were launched, there have been hardly any complaints about them, and they seem quite stable and solid. They only take bets from the UK, Germany, and Sweden, which may frustrate a number of people since they are pretty good. Red Queen has withdrawal limits of £3000 per day, it has not been clarified yet if this is negotiable for loyal players. This does not pertain to progressive jackpot winnings. They have a huge selection of software platforms – just about everything but Microgaming and Playtech – those are two that are absent from their portfolio. One thing that struck me is their dedication to responsible gambling. When signing up, you are given the opportunity to set your limits – which is a good thing. Right at the start, you can set up your loss limits. 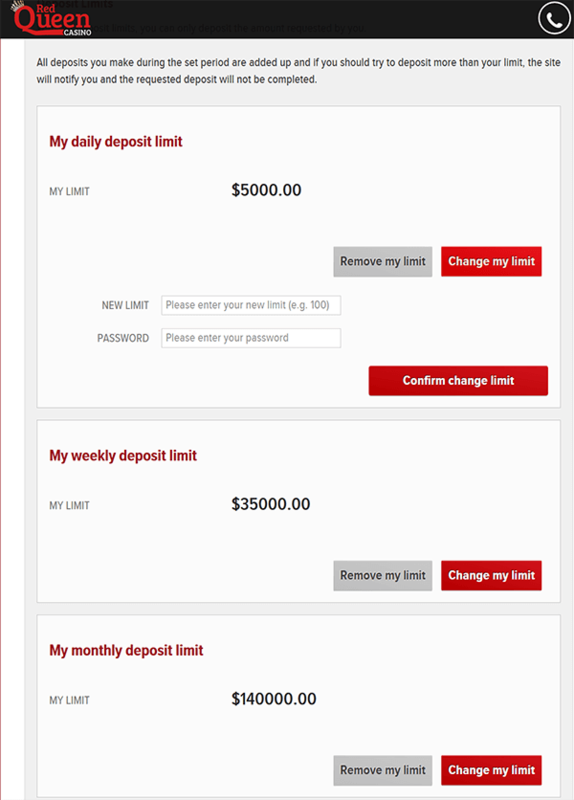 From there, you can set your deposit limits – daily, weekly, monthly. This is brilliant when you have a monthly set bank roll for this form of entertainment. 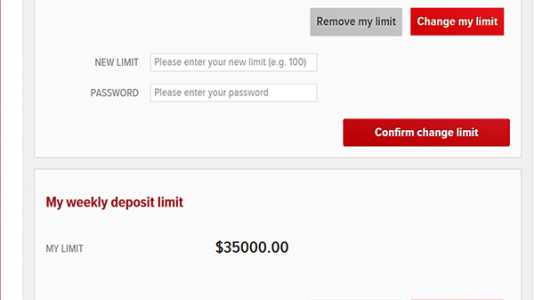 Red Queen Casino deposit limits when opening an account. Further on, you can set up time outs, reality checks, and self exclusion periods. 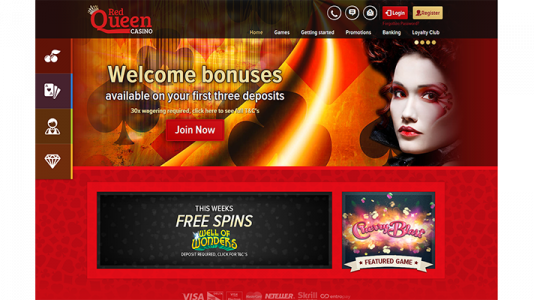 Red Queen Casino has what it takes to be an upstanding Accredited Casino at Casinomeister. They did a bang up job on their Baptism By Fire. 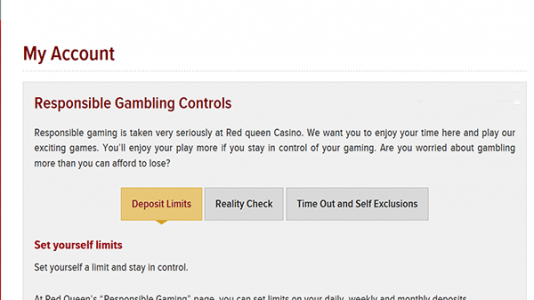 You can add your own comments here: Red Queen Casino – Accredited Casino. Red Queen Casino hosts a huge assortment of games form the following vendors: Ainsworth, Big Time Gaming, ELK Studios, Extreme Live Gaming, Gamevy, H5G, IGT, Incredible Technologies, Inspired Gaming, Leander Games, Nektan, NextGen, Pragmatic Play, Realistic Games, SG Digital, SG Gaming, Thunderkick, and Williams Interactive. 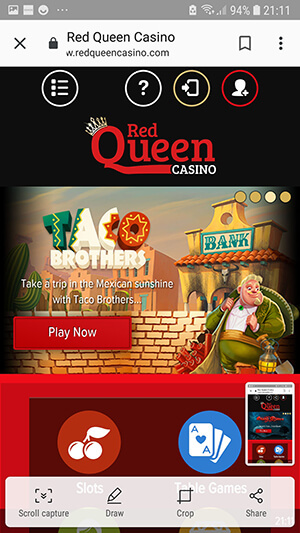 Red Queen Casino are primarily focused on slots. They have some live dealer games (Baccarat, Blackjack, and Roulette), seventeen table games to include several variations of Blackjack like Blackjack Players Choice and 3D Blackjack from WMS. And then there are the virtual sports that if you haven’t tried, you may find them worthwhile. Our cashout data is collected by our Meister Minions – these are the folks who volunteer to gather information on the casinos listed in our reviews – our secret shoppers. If you would like to join our Minions, please check out how to do so here: How to become a Meister Minion. 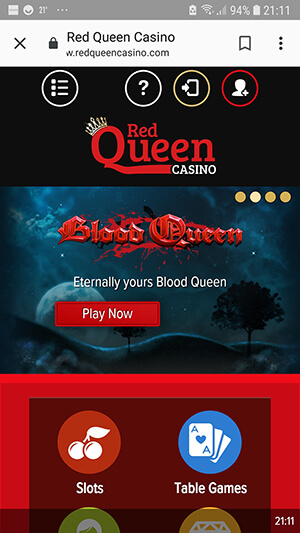 Play over 350 games at Red Queen Casino. They host a wide array of mobile games that you can play on your iPhone, Android, or any hand held device. Call us them +44 (0) 330 332 6287 UK working hours, 9am to 5pm GMT. Or use their live support. Game selection is alright, promotions used and they were fair, even though i didnt capatalize on them. Also add perhaps Trustly, which is used by probably all Swedes playing online or at least mostly. I had to deposit through my Mastercard so waiting for verifcation on that, and also u have to manually send them an email with your bank details for a iban transfer. We’ve been working with Red Queen for close to 3 years now. In that time we have only received a single complaint which was non-genuine in nature. Chris has always been very responsive to any feedback we gave. I personally think very highly of this operator. For affiliates, it’s worth noting that over the course of 2017 we saw better than average conversion with EasiGame Affiliates and a slightly above average player value. So players deliver around our average value but we get more of them with this program. As such they received our ‘Top Value Partner 2017’ award. I’ve been playing at Red Queen Casino for a couple of months now, so allow me to share my experiences. DOCUMENTS: When signing up to any new online casino, I always like to provide my documents from the off. I contacted them via email to ask how they would like me to send them. They replied within a few hours asking to attach the required documentation to the reply email. I was confirmed and good to go within an hour. Fantastic! DEPOSITS: I only deposit using my debit card. They are instant and free. GAMEPLAY: I have never had an issue with any of the games on the site. No lag, no crashing, and no freezing. Everything runs smooth. GAMES: Everything you’d want. All the very latest games, even some oldies to keep everyone happy. WITHDRAWALS: To date, I have been pretty lucky at Red Queen. In the 2 months since signing up, I have been lucky enough to win & withdraw many times. Withdrawals to debit card are lightning fast. Every single one of my withdrawals have taken less than 24 hours to reach my bank account (week days), which is impressive. There is a 3k maximum per day withdrawal limit, but as stated in the review on Casinomeister, that may be negotiable for loyal players. 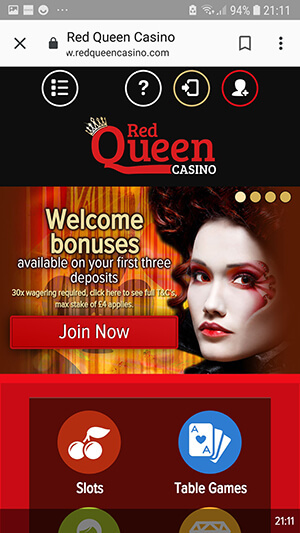 BONUSES: Red Queen frequently offer me wager free spins, and usually on my favourite games. They have a superb loyalty scheme which offers many rewards. You can also earn loyalty points which vary depending on your status. SUPPORT: Whenever I’ve had a query and when live chat is available, the guys are fast to respond. They are very friendly, helpful, and eager to help which is unfortunately still rare at many casinos. Trada Casino is the only other place I have been treated like a king. This of course is how it should be, but many lag way behind in that department. But hey, I’m a pretty nice guy, so who wouldn’t want to talk to me….right? Emails are answered same day if sent within normal working hours, and the very next morning if sent late. Live chat is available from 9am to 5pm, which is fine…..things can always wait until the morning. I am very happy to have found Red Queen Casino. They are a friendly bunch who will go above & beyond to ensure you are a happy bunny. I must also mention the stance they take on responsible gambling. A couple of weeks ago I took a day of work. The weather was miserable, so thought I’d spend the day playing my favourite games at my favourite casino. The reps noticed I was depositing more frequent than usual, so stepped in to make sure everything was alright. I assured them all was fine. What I really like about it, is the fact that they instantly pick up on this, which could be a lifesaver for problem gamblers. They use their due diligence. These guys are on the ball. I don’t have a problem with gambling, but if I did or was what is known as a ‘chaser’, I would know I am being looked after and 100% safe playing. I really do not know any casino that would do this. Usually they are more than happy to take all you got. Red Queen Casino has been around for a few years. They may be a small operation, but you won’t get lost in the cracks with them. So far, they have generated only a few complaints in our forum but more importantly, they have quite a few fans amongst our members. They passed our Baptism by Fire pretty much unscathed. Good for them – I would recommend these guys.